Former president is coming to Israel to honor President Shimon Peres and to partake in JNF event. 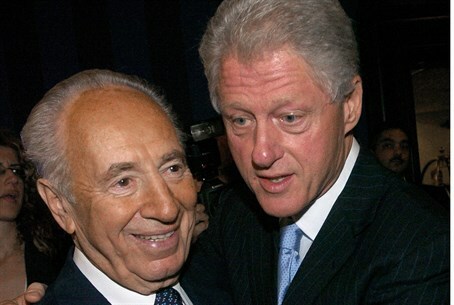 The Jewish National Fund (Keren Kayemet Leyisrael) will pay former U.S. President Bill Clinton $500,000 in return for his coming to Israel to give a speech at a gala evening in Rehovot, and at a JNF event. He will also take part in the President's Conference, where Peres will be honored by celebrities, including Barbara Streisand and Robert De Niro. The money will reportedly go to the Bill Clinton Foundation. The reports on the subject are not completely clear regarding the difference between the events and the connection between them. JNF also reportedly gave millions to the President's Conference. Channel 1's Ayala Hason said that the JNF's spokeswoman refused to say who had authorized the payment but told her “it is a great honor” to bring Clinton to the event. The gala evening will be held June 17 and will mark Peres's 90th birthday. It will be held at the Peres Academic Center in Rehovot, one of the few institutions in Israel that are named for living dignitaries. Globes said Saturday that the Peres Center has been cooperating with the JNF for a year. JNF hoped to improve the organization's image abroad by bringing Clinton to speak about it in Israel, and to have Clinton meet with its largest donors, thus bolstering donations. The Peres Center is not linked to Peres formally but its director, Ofra Elul, is wthe wife of former Labor MK Rafi Elul, one the politicians closest to Peres. Globes said the entire matter was causing great embarrassment to the President's office. Former Meretz minister Yossi Sarid said Friday that each of the people invited to the event at the Peres Center was asked to contribute 3,000 shekels for students from low income backgrounds. Peres's office reportedly did not know that the event would be used for fundraising, and said Peres may have to pull out of the event if this is the case. The JNF, founded in 1901 to redeem the land of Israel for Jewish settlement, has, since its inception, planted over 240 million trees in Israel. It has also built 180 dams and reservoirs, developed 250,000 acres of land and established more than 1,000 parks. It owns land estimated at a value of 8 billion shekels. Today, most of its annual 650 million shekel budget goes to paying the organization's own expenditures.